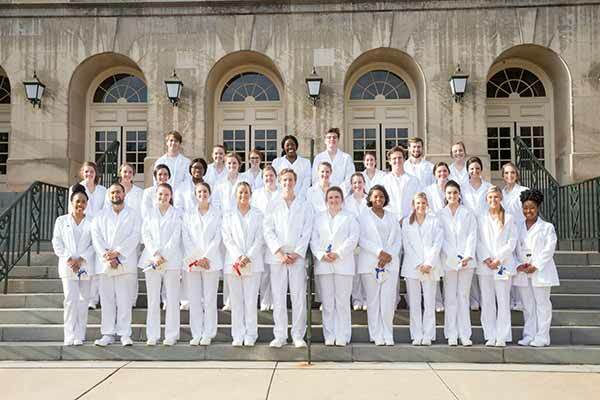 Samford University’s Ida Moffett School of Nursing hosted its biannual White Coat Ceremony on Monday, Feb. 19 in Samford’s Brock Recital Hall. Thirty-five Bachelor of Science in Nursing students who began clinical courses this semester were honored during the event. Students represented the traditional B.S.N. and the veterans’ B.S.N. programs. Samford University’s Ida Moffett School of Nursing has a rich history as a leader in nursing education, practice and service. The school is founded on the principles and philosophies of legendary nurse Ida Vines Moffett. Graduates from the school have the wisdom, skills and courage to go out into the world and make people’s lives better. The school offers a variety of degree options at the baccalaureate and doctoral levels and graduates consistently pass their certification exams at rates far surpassing national averages. Over the past 95 years, more than 4,000 nurses have graduated from the school and are practicing throughout the United States and around the world. Visit www.samford.edu/nursing to learn more. The Arnold P. Gold Foundation (APGF): The Arnold P. Gold Foundation’s overarching goal is to create the Gold Standard in healthcare – compassionate, collaborative and scientifically excellent care – to support clinicians throughout their careers, so the humanistic passion that motivates them at the beginning of their education is sustained throughout their practice. We strive to ensure that care and respect always govern the relationship between practitioner and patient.